More letters from alumni...listed by topic, and within each topic in chronological order. Items with an asterisk (*) have been most recently updated or added. For poetry by alumni, click here. Who does "admission obsession" really benefit? The SAT predicts freshman grades, but then what? How to nurture the new Einsteins? Who should have made the list of the 25 most influential alumni of all time? Click here to see the list of approximately 250 alumni considered by the panel. PAW readers respond to the list with comments and suggestions. Click here to see letters from alumni. 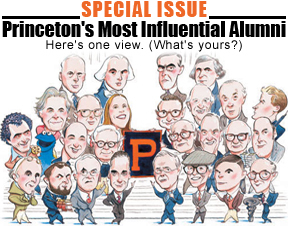 To offer your own views, write to paw@princeton.edu or to Influential Princetonians,” Princeton Alumni Weekly, 194 Nassau Street, Suite 38, Princeton, NJ, 08542.